A facsimile of the manuscript held in the Public Record Office, Kew. It includes a wealth of previously unpublished material, carrying a complete reproduction of Bligh's Log, in which he attempts to trace the course of the Bounty mutineers. 'I find that about two months after I left Otaheite in the Bounty, Christian returned with her to the very great astonishment of the Natives...' - from Bligh's Log of HMS Providence. 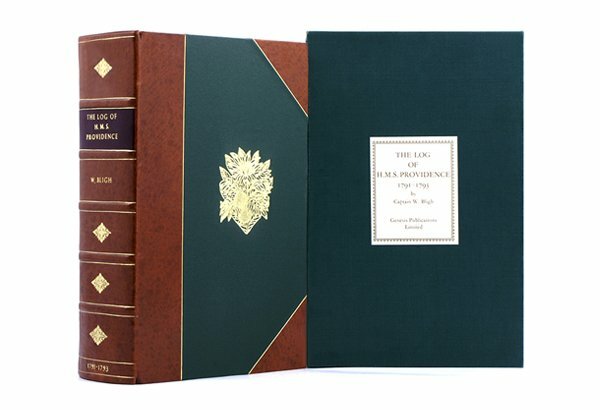 This beautifully produced limited edition contains a wealth of previously unpublished material, carrying a complete reproduction of Bligh's Log, in which he attempts to trace the course of the Bounty mutineers. The book is prefaced by the late Admiral of the Fleet, the Earl Mountbatten of Burma and introduced by Stephen Walters. It also includes: a colour collotype reproduction of Sydney Parkinson's breadfruit watercolour; a complete reproduction of John Ellis' book of 1775: A Description of the Mangostan and Breadfruits; and notes on the breadfruit plant by David Bellamy OBE.